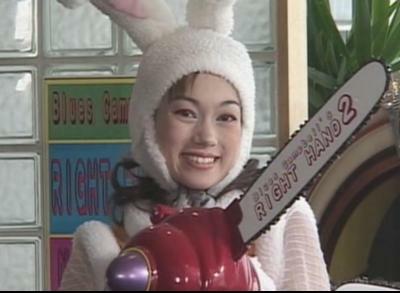 I had this image anyways, cause japanese girls in bunny suits holding chainsaws are funny, and cute. And then I noticed what was written on the chainsaw. I love it! Um, dude, I think it’s “Blues Campbell’s Right Hand.” Which, is equally odd, seeing as how the Japanese, and other Asian languages, lack the letter “L.” Just a head’s up. It does beg the question of who “Bruce” or “Blues” Campbell is though. My guess, a Slot/Pachinko parlor. but I still like the idea of a japanese girl with a chainsaw that says “bruce campbell’s right hand” on it. That’s hawt. Screen cap from Wild Zero if I’m not mistaken. Bruce Campbell, hilarious, he’s an actor. Played the tick and he’ll be in the next spiderman movie i believe. I only posted that for people who don’t know who he is. Not to insult anyones intelligence.